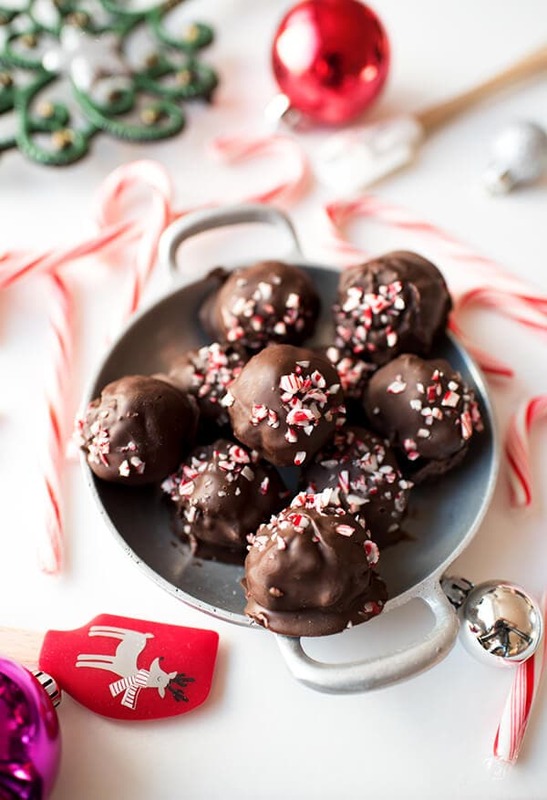 Chocolate Peppermint Truffles are a great last-minute chocolate Christmas dessert! It’s crazy how quickly Christmas can sneak up on you. Sure, it comes at the same time every year… but I swear I was just making these healthy energy balls for the New Year and now we’re just days from Santa’s arrival. If you’re baking up a storm for the holidays, you’ll be pleased to know that this Chocolate Peppermint Truffles recipe doesn’t require any baking! Make a batch up early and they’ll give you a little more energy while you finish your holiday wrapping! To make the chocolate peppermint truffles, place all of your ingredients in the bowl of your food processor, and pulse until they are fully combined. Carefully remove the blade and mixture and portion out 10 truffles with a disher or tablespoon. Roll the mixture into 10 equal-sized balls and place on a parchment-lined baking sheet. 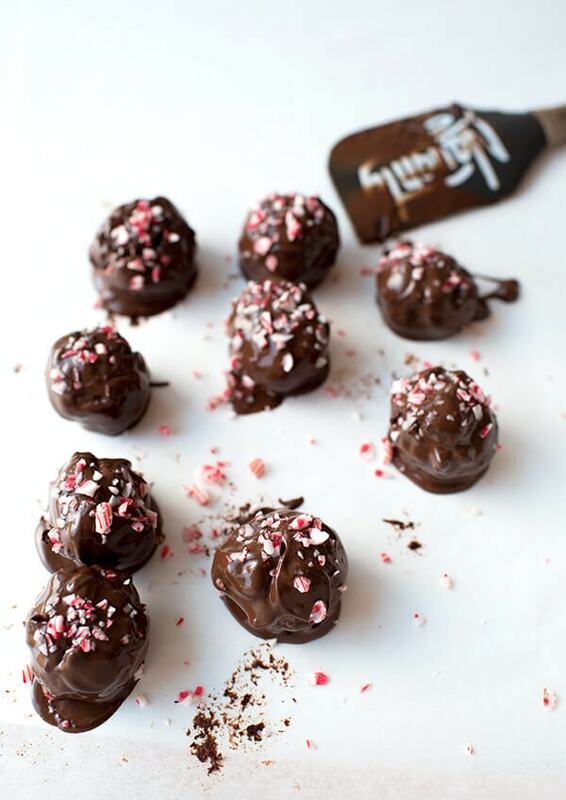 Chill the Chocolate Peppermint Truffles for 30 minutes in the fridge. Melt chocolate and coconut oil and dip the chilled truffle balls in the chocolate mixture. Remove them with a chocolate dipping fork or regular fork. and place them back on the parchment. Wait one minute, then top with crushed peppermint candy. Store the chocolate peppermint truffles in the fridge until ready to eat. This is a Christmas recipe that even the Grinch could make. But in the interest of being a good holiday helper, here are a few tips to help make this process as easy and foolproof as possible. A food processor is key to making these chocolate peppermint truffles melt-in-your mouth delicious. Once you’ve dug this kitchen gadget out from the back of the pantry, throw in the ingredients and pulse until the mixture comes together, scraping down the sides as needed. With a spatula, Miss Let’s See How Fast I Can Get to The Emergency Room. Peppermint extract is strong. Lest you want your mouth to burn like memories from the Ghost of Christmas Past, be conservative about adding in any additional extract – ¼ teaspoon at a time can go a long way. You can use whatever you want to scoop the dark chocolate peppermint truffles into balls, but I like using a tablespoon or size 50 ice cream scoop disher. That will help you perfectly portion out the 10 truffles this recipe makes, but make them as big or as small as you want. Then roll them between your hands until they’re round and place them in the fridge on a piece of parchment. If you want to make these chocolate treats a little fancier, coat them in even more chocolate and top them with crushed peppermint. First, chill the truffles in the fridge for 30 minutes so they’re hard enough to hold their shape. Then, dip them one at a time in a mixture of melted chocolate and coconut oil. Retrieve them with a chocolate dipping fork or regular fork, tapping it on the edge a few times before setting them on parchment. Do it right, and people will be asking you where you bought these beauties from. Do it wrong and more for you! When you’re crushing the peppermint stick, banging the rolling pin against the stick works better than rolling it over top. It’s also great for reliving some of that pent-up holiday stress! These chocolate peppermint truffles bites are quick, easy, and healthy-ish. They're great for the holiday season! Place cocoa powder, dates, cashews, peppermint extract, and maple syrup in bowl of food processor. Pulse until fully blended. Taste. Add additional peppermint extract as needed, ¼ tsp. at a time, pulsing between additions. 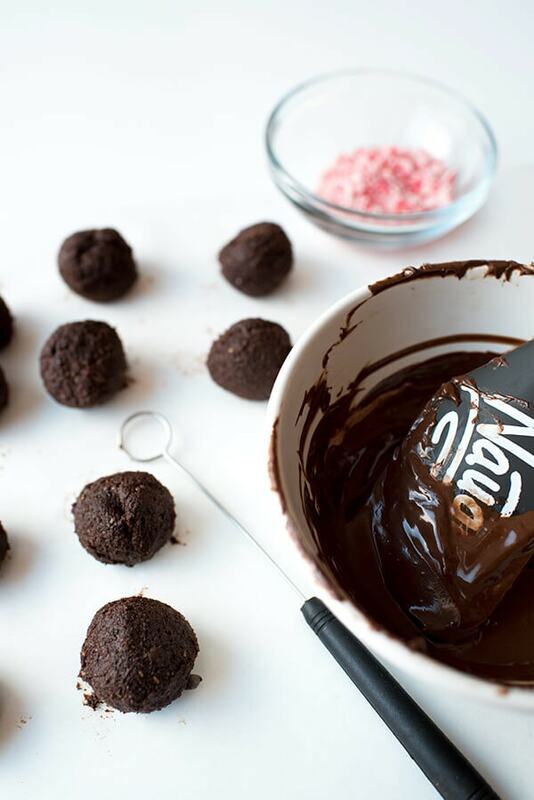 Portion out into 10 tablespoon-size truffles and roll into balls. Place in fridge on parchment-lined baking sheet. Place truffles in fridge for 30 minutes. Place peppermint stick in resealable bag. Crush with rolling pin. Melt chocolate chips for 3 minutes at 50% power, stirring every 30 seconds. Cook until chocolate has fully melted. Drop one chocolate ball into the mixture and flip a few times with chocolate dipping tool or fork until it is fully coated. Remove, tapping fork or tool on edge of bowl a few times to remove excess chocolate. When chocolate has dried a little, top each with a sprinkle of crushed peppermint stick. If you can't find unsalted cashews, rinse and dry salted cashews. You may find you don't use all the chocolate. I find it's easier to work with too much chocolate than too little. If you don't use it all, pour it into an airtight container and use for another recipe. Place the crushed candy cane in a mesh strainer and shake to remove peppermint dust. Those sound so festive while still being healthy. These energy bites sound so delicious, and look so festive and pretty!